Toyota has been a trailblazer with the Prius as the company pioneered the hybrid category. 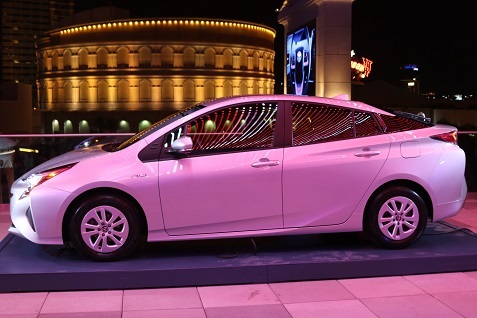 After almost twenty years and over 3.5 million sales worldwide, Toyota revealed the fourth generation Prius in the heart of the Las Vegas Strip. The event took place on the rooftop of the all-new Linq hotel on a hot evening with hundreds of other journalists and guests as the all-new 2016 Prius was elevated above the stage. The sportier design stood out immediately as Toyota has completely reimagined the exterior of the vehicle. The front fascia looks more distinctive with aggressive headlamps, and I liked the rear lamps even more. The new Prius is 2.4 inches longer, 0.6 inches wider and 0.8 inches lower than the previous model, and these subtle changes contribute to the new look. After years of playing it safe, Toyota has opted for bolder designs over the past year and the new Prius continues that approach. Of course, the Prius is known as the ultimate green vehicle, so the new Prius features an expected ten percent improvement in EPA estimated MPG on core models. Toyota claims you won’t be able to find better fuel economy on any vehicles without a plug. The new Prius features smaller and lighter hybrid system components, higher-energy density in the batteries, and an internal combustion engine with more than a forty percent increase in thermal efficiency. Toyota is also planning a new Eco model that will be unveiled soon with even better fuel efficiency. Toyota is also emphasizing safety in the new Prius which features a more rigid structural framework to help enhance occupant protection in the event of a collision. It also features a high strength upper body that is designed to distribute frontal collision impact energy. The Prius will also be among the first U.S. models to offer Toyota Safety Sense (TSS) with features including pre-collision braking and lane departure alert. Given the impressive new design for the Prius and the enormous success of this model, it’s not surprising that Toyota decided to introduce the all-new 2016 version with a big party in Las Vegas. We’re looking forward to driving it as well.